Eurostar are therefore using a 'traditional' reach channel to drive traffic to an area where they can engage more deeply with the target audience. This is also an example of 'just because you build it, doesn't mean they'll come.' 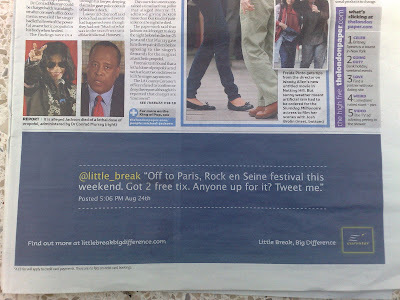 The Eurostar Twitter activity is not a social media campaign, more of a socialising of a larger strategy - with Twitter acting as a hub that other media is driving to. This sort of strategy is becoming more widespread, whether it's Dance Flick driving traffic to a Facebook Fan Page, T-mobile promoting their YouTube channel, Pepsi Raw promoting Twitter on it's cans or Ben Stiller appealing to Ryan Seacrest to help him recruit followers, people are starting to understand that social cannot exist in isolation, social activity needs to be highlighted (and part of a wider strategy) in order to gain attention. Sorry there is a spelling mistake to the link to the Twitter account. 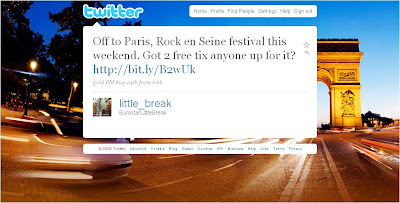 It is @little_break http://twitter.com/little_break. Otherwise thanks for the post, very useful. Thank you for spotting! I have corrected it now - glad you found the post useful. Very interesting this post! First time I'm seeing something like that on webmarketing.